07:30 Good morning and welcome to the first AUTOSPORT Live commentary of the 2013 season, as Formula 1 testing kicks off at Jerez. 07:31 The sun is just breaking over the hills of Jerez, but we've already had action in the pitlane as Marussia unveiled the MR02, the first true product of the team's revamped technical structure. 07:35 We've also got Caterham's unveiling at 08:45, before the test kicks of in earnest in just under half an hour. 07:48 AUTOSPORT's Jonathan Noble is down in the pitlane as Caterham unveils its 2013 challenger. He's a handy snapper too. 07:49 And for the full story on the Caterham launch, click here. 07:50 45 minutes into the day and we've already had two new F1 cars launched. 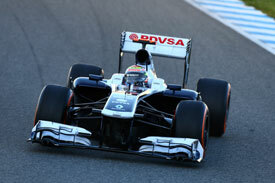 Pretty soon, we'll have them all out on track - although Williams will of course be running its 2012 FW34 here in Jerez. 07:52 Incidentally, pictures of every F1 launch from this year are here. 07:54 Into the final 10 minutes, which seems as good a time as any to recap today's line-up: Felipe Massa for Ferrari, Jenson Button (McLaren), Paul di Resta (Force India), Giedo van der Garde (Caterham), Max Chilton (Marussia), Daniel Ricciardo (Toro Rosso), Mark Webber (Red Bull), Nico Hulkenberg (Sauber), Lotus (Romain Grosjean), Nico Rosberg (Mercedes) and Pastor Maldonado (Williams). Phew. 08:12 News from Edd Straw in the pitlane: Mercedes went for a full practice start, but after roaring away in first gear the car suddenly dipped into neutral on the shift up to second gear. 08:17 Massa in after three laps, and we have a track lull: the perfect opportunity to alert you to some of the features AUTOSPORT will be running during this first week of testing. 08:25 AUTOSPORT contributor Craig Scarborough has also been busy getting underneath the skin of several of 2013's likely challengers, including the offerings from Lotus, McLaren and Ferrari. It's the Red Bull RB9 which he feels is still the class of the field - and you can read why here. 08:31 Incidentally, Valtteri Bottas - or just BOTTAS as he's known in the AUTOSPORT towers - is on Twitter. Get following him here. 08:32 First red flag of the day (and 2013 in fact), and it's for McLaren. 08:38 Jenson Button stops at Turn 4, clambers out and then watches on as three marshal trucks arrive, realise they can't do anything and then stand and watch themselves (yes, it's our first marshal/truck watch of 2013 testing). Eventually McLaren pull up and the covers go on, just as the low loader appears. 08:41 And we're loaded up. The car is on the truck, Button has been whisked away and we should be looking at an imminent resumption. 08:47 Risky move as the course car dives down the outside of the low loader down the main straight. It's side by side for a while, until the course car cedes position just before the pair turn into the pitlane. 08:51 Mark Webber wastes no time heading out - there was about one second between the green flags flying and his RB9 bursting out of the Red Bull garage. 08:53 Nico Hulkenberg, Paul di Resta, Felipe Massa, Nico Rosberg, Giedo van der Garde and Daniel Ricciardo all out too. 08:54 Glenn Freeman on track watch reports that temperatures are (finally) soaring - 15 degrees now, even if the air temperature remains a cool seven. 08:56 The drivers are taking advantage of the improving conditions too - just after Webber sets a personal best, Rosberg lowers the overall benchmark to a 1m20.846s. Massa follows that up by slotting into second, albeit some 1.6s down. "It was a great start, everything went to plan: it all fitted very well, it was all good and I could straight away push when I was out there, and that was very enjoyable. The car was balanced well, so it was a perfect start. As a result I look forward to driving a full test day tomorrow." 09:02 And we have our 11th car: Romain Grosjean heads out for his first lap in the Lotus E21. 09:03 As Grosjean comes in, Massa - second fastest so far today and with 10 laps under his belt - heads down the main straight at half chat. That's something we saw a lot of last year at Jerez. 09:07 Heikki Kovalainen sent his regards to Caterham earlier today, tweeting: "F1 testing resuming today - thanks for the Caterham F1 Team for the past 3 years and I wish them all the best for the future!" “As part of our preparations for the 2013 season, we took the decision to launch our FW35 in Barcelona for a number of reasons. We have already spent a great deal of time rig testing key areas of the new car for reliability, including doing over 3000kms on the gearbox and rear suspension and 7000kms on our 2013 KERS, and we are happy with the results we have seen. Our cars also passed all mandatory crash tests for 2013 and so were fully FIA homologated earlier this year. 09:15 Chilton comes round for his first flyer, a 1m33.533s. He's on the orange hard compound. 09:19 His first flying laps completed Chilton heads back in, leaving Nico Hulkenberg (on hards) as the only man on track. 09:20 Something we said? Nico Rosberg rejoins the fray after a practice start at the end of the pitlane, while Daniel Ricciardo follows him out moments later. 09:23 The session has been stopped. 09:25 Nico Rosberg is staring at the rear of his W04, while a marshal circulates with a fire extinguisher - which happily isn't needed at the moment. 09:29 Rosberg is stopped at Turn 11 - that's the Senna chicane, although the German elected to go straight on and stop before rejoining the main track. He's on the tarmac at the Alex Criville curve. 09:30 The low loader arrives, and a few interested Mercedes personnel have a quick scout of the rear end of the car. The smoke was only on CCTV and doesn't seem to have lasted long. 09:37 While most of the F1 fraternity is here at Jerez, Fernando Alonso has elected to skip the first test - but he's not resting by any means. "Another good workout this morning in bike at high intensity," he says on Twitter. "Rest and gym this afternoon." 09:38 The track is reported to be clean where Rosberg stopped, and his car is now almost back at the Mercedes garage (via the low loader of course). 09:43 Paul di Resta is the only man out on track at the moment. The Scot has managed seven laps so far today, but not a single flyer. He's running with a sensor on the top of the roll hoop. 09:43 And talking of sensors, Button was doing aero evaluations of the McLaren front wing when he stopped earlier today. 09:45 Still no flyer for di Resta, who heads back in. Giedo van der Garde and Pastor Maldonado, with a collective 20 laps between them, the only men on track now. 09:51 Pastor Maldonado jumps up into second with a 1m21.215s, 36 hundredths of a second down on Rosberg. 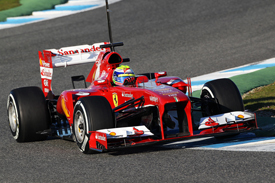 Felipe Massa is third (1m21.598s), just ahead of Daniel Ricciardo (1m21.630s) and Nico Hulkenberg (1m22.593s). Mark Webber is just over two seconds down on Massa, Giedo van der Garde a similar distance again and Max Chilton just over eight seconds off. Paul di Resta, Jenson Button and Romain Grosjean are all yet to set a time. 09:57 Maldonado, Ricciardo, Hulkenberg and Chilton are all out on track and finding time. Ricciardo moves into third with a 1m21.316s, while Chilton improves to a 1m27.846s but stays eighth. 09:59 Is that our first double-overtake of the season? Ballsy stuff from Chilton as he picks off Maldonado and Hulkenberg, even if the latter duo were only travelling at half speed. Van der Garde heads out on hards. 10:09 We have an interested observer in the pitlane today - a certain Lewis Hamilton. Glenn Freeman watched the 2008 world champion's first laps for Mercedes yesterday, and got his thoughts ahead of his first official day of testing tomorrow. Here's a snippet. "I try to prepare myself knowing that the car was a long way off last year, they were a long way behind. I do know that they have some improvements on this year’s car but it is an evolution: the foundation is the same but it has just been improved in certain areas. But I hope that it’s a massive improvement. Only Nico will be able to say if it is..."
10:13 Toro Rosso technical director James Key has just been talking to the media. He says he's happy with the work the team has done already today, saying the priority so far has been aero and temperature measurements. 10:15 Romain Grosjean sets off on his first flying run, and it brings instant results - he's fastest overall in the first sector and eventually comes round in a 1m21.219s, just over three tenths of Rosberg's best. 10:17 Five laps now completed, Grosjean heads back to the Lotus garage, leaving Massa and Webber the only men on track. 10:19 AUTOSPORT 's Jerez testing gallery is now live - check out all the latest photos from Formula 1's first pre-season test of the season here. 10:22 Edd Straw, our roving pitlane reporter, has been speaking to Sauber. The team is doing car systems checks and aero measurements and reports that all is normal. 10:30 We've got a motorised version of a Spanish bull run at the moment, as Webber and Ricciardo chase each other at opposite ends of the circuit. Neither man really threatening their personal bests, but they are both now up to the 20-lap mark. 10:35 Edd Straw is a busy man. His latest update comes from Williams, with the team reports it is content with the early running. There are some 2013 aero developments on the car, but the primary focus is on working with Pirelli's new compounds. 10:36 And as we write that Maldonado pops up second in the timesheets with a 1m21.019s, 0.173s off Rosberg. The German hasn't been out since his earlier electrical issue. 10:37 On that front Jenson Button has also been sidelined since bringing out the first red flags of the test. The Briton has completed just three laps, and none of them flyers. 10:41 Romain Grosjean and Lotus, conversely, are back out and flying. The Frenchman didn't leave the pits for the first hour and still has just eight laps under his belt in the E21, but he's just improved to a 1m21.175s, which keeps him third. The car looks particularly quick in the first sector, where it tops the speed trap. 10:46 As Edd Straw reported, Williams is running a selection of 2013 developments on last year's car - including the obvious, and not unwelcome, addition of the so called 'vanity panel'. 10:50 Paul di Resta paints the timing screens green, setting a series of personal bests in the VJM06. On the medium compound he's worked his way down to a 1m21.710s, which includes a new overall best in the third sector speed trap. 10:57 After a short break di Resta is back it, shaving a few thousandths of a second off his personal best. 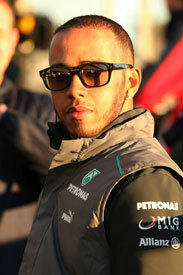 He stays seventh, with 0.801s separating him and Nico Rosberg at the top of the timesheets. He has Nico Hulkenberg and Mark Webber for company out on track. 11:03 Ricciardo gets down to a 1m21.311s on the hard tyre, just as Grosjean heads out on mediums. 11:04 And now a 1m20.547s for Ricciardo, the best we've seen so far at Jerez. 11:08 Ricciardo follows that up with a 1m21.040s, still faster than everyone but Rosberg and Maldonado. The Toro Rosso is on song at the moment. Team boss Franz Tost said at yesterday's unveiling that he wanted to finish sixth in the constructors' championship, and that the pressure to do so fell more on the team than its drivers. 11:13 McLaren is struggling with a fuel pump-related issue, we've been informed. The team has managed just three laps so far, and none of them flyers. 11:19 Given the on-track calm (Webber is back in), it's the perfect time to ponder whether Formula 1 is facing an impending financial crisis. No, says Ross Brawn; yes, says Cyril Abiteboul. 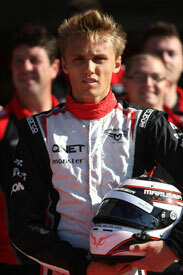 Oh, and Lewis Hamilton reckons F1 losing Heikki Kovalainen is 'crazy'. Read it here. 11:21 We have cars again - Webber heads out and, as he comes round for the first time, Maldonado exits the pitlane to join him. 11:27 Ricciardo still leads the way, but Maldonado is doing his best to close the gap - the Williams man has worked his way down to a 1m20.864s, just over three tenths shy of the Australian. 11:30 Paul di Resta, on the medium compound, bangs in a 1m20.558s to go second fastest. Just the 11 thousandths of a second between him and Ricciardo now. 11:39 We haven't seen a mass of practice starts so far at Jerez, but Giedo van der Garde lights up the end of the pitlane on his way back onto the track. Felipe Massa and Daniel Ricciardo will keep him company. 11:42 Toro Rosso is planning a switch away from Ferrari power in 2014. Jonathan Noble has the latest on the team's plans. 11:45 Webber leaves the pits and finds himself behind Massa on the track. 11:46 Looks like Massa backed right off to let Webber past, as the Red Bull is now a long way clear of the Ferrari. 11:47 Weather watch: track temperature now up to a snug 30 degrees. 11:48 Beyond informing AUTOSPORT's jumper and cardie choices for the day, the temperatures are crucial to teams as they try to figure out the behaviour of the new 2013 Pirellis. 11:49 Air temperature is now 15 degrees. 11:49 Webber is back in, leaving Maldonado, Massa and now also Chilton on track. 11:50 Now Massa pits as well. The theme this morning is definitely short assessment runs. 11:52 The longest 'stint' anyone has done so far this morning is an 11-lap outing for Webber. Di Resta did an eight-lap string, most have done less. 11:53 Maldonado, now on lap five of a run all in low to mid 1m26s, is chasing down Chilton. 11:54 The Marussia is only cruising down the straights, running constant speed aero tests most likely, and Maldonado breezes past. 11:54 Chilton pits as Webber goes back out. 11:54 Di Resta also hits the track in the Force India. 11:55 Di Resta quickly pulls aside to let Webber through. 11:56 Only 15 laps from Grosjean so far today but Edd Straw has spoken to Lotus and the team says it's working through its shakedown schedule as planned and is happy. 11:57 Just an out/in run from Webber, who pits again. 11:58 Di Resta jumps to the top with a 1m20.3s lap. 11:58 The Force India driver's 1m20.343s effort puts him 0.058s ahead of erstwhile pacesetter Ricciardo, and included the quickest sector one time of the morning so far. 11:59 After that rapid run, di Resta backs off, coming around next time with a 1m28s. 12:02 Di Resta, who was on medium Pirellis, did a 1m20.9s on his third lap, then backed off again and has now pitted. 12:03 The hot lap/back off/hot lap programme is a common one during testing. 12:03 Now Webber, on hards, and Massa rejoin the track. 12:04 A recap of the order at half-time: 1 di Resta, 2 Ricciardo, 3 Rosberg, 4 Maldonado, 5 Grosjean, 6 Hulkenberg, 7 Massa, 8 Webber, 9 van der Garde, 10 Chilton, 11 Button. 12:04 Button has not yet set a time due to the McLaren's fuel pump problem. 12:05 Massa passes through the pits, stops briefly, and resumes. 12:05 Highest lap count of the morning belongs to Maldonado, with 52 laps for Williams. Di Resta, Ricciardo, Massa, Hulkenberg and Webber have all done 30-37 laps. 12:06 Only 11 from Rosberg, 15 from Grosjean and three from Button. 12:15 Grosjean goes fastest for Lotus. 12:15 The Frenchman does a 1m19.796s, the first sub-1m20s lap of testing. 12:15 That puts him on top by 0.547s. 12:16 Grosjean follows that lap up with a 1m20.8s effort next time past. 12:16 There was some concern about Lotus's lack of activity from its huge fanbase earlier today, but the team told AUTOSPORT it was just following a shakedown plan, and now it's unleashing some pace. 12:17 Last year Lotus took opening day honours with Raikkonen. 12:18 That time from Grosjean came on the hard Pirelli tyres. He's now shown '1L' on his pitboard. 12:21 All cars have now returned to the pits. There's no official lunchbreak at the Jerez test, but that means we see natural lulls when teams get hungry. 12:22 The gap between Grosjean and di Resta at the top is 0.547s, but it could've reduced. 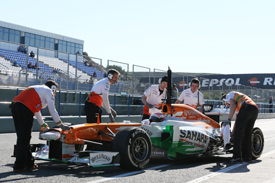 Di Resta set personal bests in sectors one and two before pitting. 12:24 Maldonado breaks the silence with a practice start at the end of the pits. 12:25 As usual AUTOSPORT Live will be giving readers plenty of opportunity to interact with us as the test goes on. 12:25 As well as asking for your opinions on F1 issues and your questions for our team in the paddock, we're also lining up some special guests for you to quiz later in the week. 12:27 Maldonado passes through the pits again, pauses for another practice start and launches off with a healthy tyre burn-out. 12:27 Webber is also setting off again in the Red Bull. 12:28 Keep checking our gallery for regular pictures from Jerez, plus detailed shots of all 10 new-car launches so far this year. 12:28 Di Resta and Massa also rejoin the track. 12:29 No one setting flying laps at the moment. The drivers in action are either doing slower speed evaluation runs or are coming in and out of the pits. 12:30 Except Massa, who improves to sixth place with a 1m21.024s lap. 12:30 That edges the Ferrari in between Maldonado's Williams and Hulkenberg's Sauber. 12:31 Di Resta and Maldonado are the other cars still on the circuit. 12:40 Maldonado is on a relatively long run, but seemingly with high fuel. The Williams's times are in the 1m26-1m28s region at the moment. 12:40 Grosjean has just commenced a run with a 1m22.5s. 12:44 Maldonado pitted after eight laps, with a 1m27.2s average time on that run. 12:44 Grosjean continues onto a fifth lap, continuing to circulate in mid-1m22s. 12:44 Webber is now coming out to join the Lotus. 12:51 Grosjean's stint is becoming one of the longest of the day as he goes onto his 10th lap. His times have risen from 1m22s to 1m24s. 12:52 Our morning test report is now live for a recap of everything that has happened so far on day one. 12:54 Grosjean has now come into the pits, having averaged 1m23.134s on that run of nine flying laps. He started in 1m22s and finished in 1m24s. 12:54 That leaves a currently empty track as Jerez hits a natural lunchtime lull. 12:59 Webber goes back out to give us some action to follow. 13:02 Webber is quickly up to speed and jumps to fourth place. 13:02 The Red Bull delivers a 1m20.601s lap, 0.9s off pacesetter Grosjean. 13:02 Van der Garde and Hulkenberg are also back in action. 13:03 Webber backs off next time around and does a 1m30s. 13:04 It's a hot-lap, back off, hot-lap affair for Red Bull, as Webber does a 1m21.1s. 13:10 Van der Garde is on his first proper run since early this morning. Lap times have varied so far, a couple of 1m23s mixed with 1m29s and 1m25s. 13:10 Hulkenberg is on a run that is getting progressively faster. Four laps in and he's gone from 1m25.9s to 1m22.8s via some 1m23s. 13:11 Webber continues to alternate fast laps with much slower ones. His 'on it' times so far have been 1m20.6s, 1m21.1s and 1m22.3s. 13:12 But the 1m30s and 1m36s in between will frustrate AUTOSPORT Live's biro-and-a-back-of-an-envelope average pace calculation system. 13:12 Hulkenberg and Webber now pit, leaving van der Garde out alone. 13:13 The Caterham comes down the pits straight slowly on a constant speed aero test. 13:14 Early reports from AUTOSPORT technical expert Gary Anderson out on track are that the Lotus looks good, and the Toro Rosso and Force India show promise. 13:18 And yes, that does mirror the current top three on the times, but how often in testing are those times deceptive? Remember the day last year when a visibly unpleasant-to-drive Ferrari set a morale boosting flyer. 13:19 Only man out now is Ricciardo in the Toro Rosso. 13:24 Button sets out again now, rejoining for the first time since his McLaren hit fuel pump problems this morning. "This morning was a pretty incredible feeling I have to say. Heading out the garage for the first time you feel not just your own excitement but, for the mechanics around me and the team back at home, this is what they've all been working for over a long winter. "It's a big moment, especially as everyone seems pretty confident with what we have here. So far so good. Things really couldn't have got off to a better start when you think that we're all getting to grips with a pretty new package. "There's quite a detailed programme we need to follow to start to understand the car, so it's a slow and painstaking process. As we've started testing on time, we've got plenty of room to keep building over the next few weeks, so that's pretty exciting as Australia will be here before we know it." 13:31 Only man on track now is Hulkenberg, as Button swiftly pitted again. 13:33 Button heads back in, but he has at least boosted his lap count to five, even if he is still yet to set a time. No sight as yet of Nico Rosberg however, who caused the other of today's two red flags when he stopped earlier this morning at Turn 11. 13:38 Nico Hulkenberg is the only man out on track at present, and he makes full use of that freedom by almost coming to a halt down the main straight several times, all in the name of testing. 13:42 Mercedes won't run again today, it confirms via Twitter: "Jerez update... after identifying the cause of the problem, we will not be running again today whilst parts are modified ready for tomorrow"
13:48 Giedo van der Garde finds a chunk of time as he comes round in a 1m22.791s - that will keep him 10th but does at least allow him to close to within 2.9s of the outright pace. 13:48 Jenson Button and Paul di Resta are our other men currently on track. 13:49 A little more detail from the Mercedes camp, following the announcement that the team won't run again today: "The part which requires modification is the wiring loom where the electrical fault originated this morning." 13:51 Another out-lap/in-lap combination for Button. Di Resta and van der Garde stay out and are on mediums, while Ricciardo has joined on hards. 14:01 Force India on Twitter: "@pauldirestaf1 is doing some longer runs in the #VJM06 at Jerez this afternoon and assessing the set-up changes made during the lunch break." 14:02 Edd Straw has headed trackside this afternoon, and he's seen a few lock-ups from Paul di Resta's Force India in the final sector of the lap. 14:08 Hulkenberg pits, shortly after Edd Straw sees him miss the chicane towards the end of the lap. Jenson Button heads out, as a few British fans appear opposite the pits. 14:10 Di Resta brings a run of 12 flying laps to an end, the fastest of which was a 1m24.9s. Button has the track to himself. 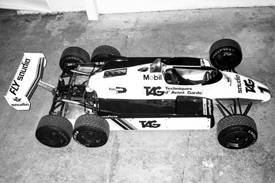 14:11 When the Sauber and Force India were on track together, Edd Straw observed that the Swiss car looked the more nimble. He reckons di Resta could have been battling a car with a heavier fuel load. 14:13 Jenson Button is back in the pits, and he still hasn't set a lap time today. Team boss Martin Whitmarsh is holding a media briefing at the moment which should offer some insight into McLaren's day. 14:16 With nothing on track, now seems a good time to remind everyone of the big story this afternoon: Mercedes will not be back out today after an electrical problem forced Nico Rosberg to stop out on track earlier. 14:22 Hulkenberg's Sauber breaks the silence on track. 14:25 Jonathan Noble says that Martin Whitmarsh's media session is over-running. Hopefully that means he's got a few interesting things to say about McLaren's day. 14:29 No problems for Hulkenberg at the chicane this time, as he's backing off to get away from di Resta. By the time he gets to the start/finish straight he's back on it. 14:30 Button heads back out. We're still waiting for the McLaren's first 'flying' lap of 2013. 14:32 Four cars on track now, as Daniel Ricciardo gets involved for Toro Rosso. Hulkenberg slows almost to a stop on the start/finish straight and then picks up the pace again. 14:33 Button finally posts a lap time - a 1m20.848s to go sixth quickest. 14:35 The McLaren improves again, with a 1m20.611s moving Button ahead of Rosberg's Mercedes and into fifth. Edd Straw says the MP4-28 had a wild moment on the exit of the double right-hander before the chicane. 14:38 Max Chilton heads back out, joining the track just behind a nose-to-tail di Resta and Ricciardo. 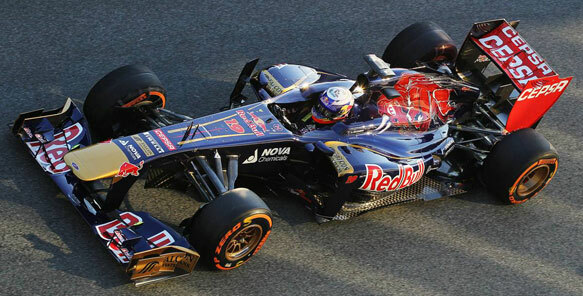 The Toro Rosso was the quickest of the cars on track at the moment before he hit traffic. 14:39 Di Resta clearly wasn't up for playing ball and letting Ricciardo through, so the Australian has backed off to get some clear space. 14:40 Just a lap later the Toro Rosso is back on the Force India's tail, and again Ricciardo backs off. 14:41 Behind them Chilton has set his fastest lap of the day. His 1m24.176 leaves him 4.3 seconds off the pace. 14:42 The British rookie then brings the red flags out, having gone off at the end of the backstraight. 14:44 It's hard to see if there's any damage to the car, but judging by how far into the gravel it's gone, and how close it is to the outside barrier it is. 14:47 Marussia mechanics have arrived on the scene, and are taking a good look at the right rear corner of the car while the recovery trucks wait to be called into action. 14:49 Chilton has left them to it, heading back to the paddock on a scooter and waving at our trackside observer Edd Straw. Our man has been joined by Jean-Eric Vergne in the final sector, too. 14:50 As the Marussia is taken away, we get a better look at the damage. The car has taken a hit on the right rear and damaged the suspension. 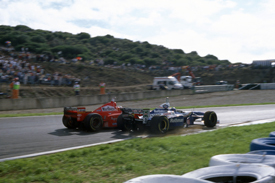 14:53 The corner where Chilton crashed is of course known better as Dry Sack - a hairpin made famous by Jacques Villeneuve and Michael Schumacher's clash in the 1997 title decider. 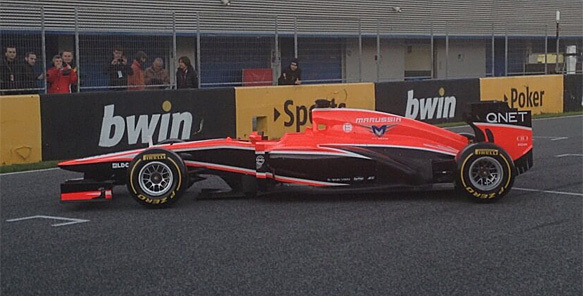 14:55 The Marussia is almost back to the pits. Unlike when McLaren and Mercedes had problems earlier, the mechanics haven't covered the car before its return. 14:56 Only the damaged part of the Marussia is covered as the team gets it off the back of the recovery truck. 14:58 The track is open again, and Felipe Massa is first to head out on a set of medium compound tyres. Pastor Maldonado follows, and does a practice start at the end of the pitlane. 15:00 Hulkenberg is next out. Sauber is vying with Force India and Williams for most laps run today. 15:02 Our AUTOSPORT team have all returned to the media centre, having spoken to the likes of Christian Horner, Martin Whitmarsh and Nico Rosberg in the last hour. More to come from them shortly. 15:04 Worth noting that while McLaren experienced another fuel pump failure today, that part has been redesigned following its similar troubles towards the end of 2012. 15:06 Lots of burnouts from Mark Webber as he heads down the pitlane. He stops briefly before making a practice start. 15:12 Edd Straw has been checking out suggestions that Chilton's crash was caused by a mechanical failure. He says the team is currently investigating. 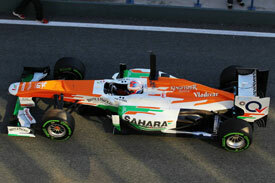 15:20 Just two cars on track at the moment as the test day goes into its final stages: di Resta and Maldonado. 15:21 Di Resta is six laps into a quite consistent run. A string of high 1m24s started it, now he's into 1m25s. 15:22 Massa comes out and goes straight on the pace, improving to fourth with his first lap. 15:23 It was a 1m20.536s from the Ferrari, and it's followed by a 1m21.5s then a 1m21.8s. 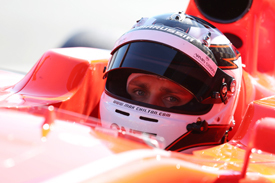 15:23 News from Marussia: Max Chilton's earlier crash was caused by a suspension failure. 15:24 "We've identified an issue with the rear suspension which requires further inspection and so we won't take part in any more running for today," said the team. "After such a positive start to our test it is disappointing, but this is what testing is for and, most importantly, Max is just fine." 15:25 Hulkenberg is next to improve as he does a 1m20.699s to advance to seventh place. 15:26 The track is getting relatively crowded now: di Resta, Massa, Webber, Button, Hulkenberg and van der Garde are all out. 15:27 Webber goes quickest. The Red Bull delivers a 1m19.709s. 15:28 That puts him just 0.087s ahead of Grosjean's Lotus, but it's a possibly ominous sign given that the champion team often plays it cool in early tests. 15:28 Button shows McLaren's hand more too, jumping to third with a 1m20.081s. 15:29 Webber drops back to a 1m21.398s with his next lap, while Button is only a little off his previous best with a 1m20.375s. 15:31 Williams gives its fans some reassurance as Maldonado prepares to head out again: "The boys are running through the test programme but it takes time to do the changes.... that's what happens when you can run all day!" 15:31 Both Button and Webber set their fast times on medium tyres. 15:33 After that timesheet-topping 1m19.7s, Webber dropped back into 1m21s, and now a 1m22s. 15:34 Button's times were more consistent. He has gone from a 1m20.081s to a 1m21.395s, losing almost exactly 0.3s with each lap. 15:37 Webber completes that five-lap run. His average was in the 1m23s, but a very slow mid-outing lap skewed that statistic. 15:37 Button continues round in mid-1m22s. 15:40 Back into the pits now for Button to wrap up eight timed laps, his pace ending up in the 1m21.4s bracket by the end of the outing. 15:41 Hulkenberg, meanwhile, is back on track for Sauber, with Grosjean the only other man out there now in his Lotus. 15:43 Pace in the mid 1m22s range for Grosjean as he works around a ninth timed lap of the run. 15:44 Webber's pace-setting Red Bull is now back on track. 15:47 There's some late movement from Button, di Resta and Hulkenberg as the clock ticks towards the final 10 minutes of the opening day in Jerez. 15:49 Button flashes past the pits in 1m18.861s to put his McLaren on top of the times. 15:51 The new best comes from Button's first lap of a run, with a follow-up of 1m19.696s next time by. 15:53 Button wraps up a short outing on the hard tyres with a 1m20.450s before returning to the McLaren garage. 15:55 Grosjean, di Resta, Hulkenberg, Maldonado and van der Garde are the men on track with five minutes of the session remaining. 15:57 A late improvement in the first sector for Grosjean but the overall lap isn't quicker in the Lotus. 16:01 And that's it - the flag is out on day one at Jerez. Join us for more from 08.00 GMT tomorrow.